THE MARCH – You Were Warned In The Book In 1972 & The Film In 1990! this was a prophetic book of 1972 – made as a film and shown on TV in 1990. The movie was only ever shown on TV and no DVD was ever released – could it be that it is not politically correct to make a DVD available of something so prophetic when released and so prescient today! Sadly, probably because it does not meet the BBC’s exacting standards of Politically Correct interference in matters of taste and freedom of speech as they control their propaganda output as funded from taxes levied in Britain and the EU (from whence they derive massive funding, presumably for following the PC line and propaganda for the EU), the movie seems now to be unavailable on the internet and copies of the movie, which was only shown once on the BBC, seem unavailable. Next are we to expect book burning! As part of mind control to fit the BBC’s propaganda as they work for a self styled, self selected elite despite being utterly dependent on milking the tax payers of Britain and the EU! This video contains content from BBC Worldwide, who has blocked it on copyright grounds. Sadly this excellent movie is no longer available to view due to censorship. Should we be prepared for Book Burning next of non PC Books? 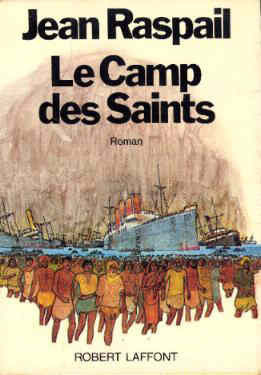 “The Camp of the Saints,” by Hean Raspail. In the light of world conditions today, this 1972 book is very prophetic. Sounds familiar, doesn’t it! Of course it does. Every far right fool has been in the past fortnight competing how to insult those poor, exhausted, tired, hungry, frightened, innocent humans trying just to survive and hoping to re-build their lives. There seems to be no serious effort to address the causes of the problem. Despite the fact that I am gravely ill, in horrendous constant pain and suffering further deterioration of my health (directly attributable to UKIP), I feel I must say something. Many of you will be surprised when you see me in many photos standing with George Osborne, David Cameron, David Davies, Boris Johnson and many other notable and senior Tories, shaking my hand, without masks or protective equipment regularly used when dealing with those “horrible swarms of immigrants’. Yet, I was an asylum seeker and a refugee too. I was in the same shoes as those desperate souls in Calais who having been exploted by people traffickers, endured much and often great hardship even to reach Calais have now become targets of horrific, racist abuse in the past fortnight. I therefore feel a strong urge to tell everyone, with any brain cells to stop and think before opening their mouth. Why? Because if that could have happened to me, it can really happen to you too. It has been claimed for many years that even the supposedly civilised free world are only five meals from anarchy! Before you jump on the bandwagon and accuse me of being a stupid foreigner, a dirty Slav, coming from some poor under developed country and similar UKIP style populist insults, it is worth, for your own sake, to hear the unpleasant truth. Unlike many keyboard warriors, I was born into a very wealthy establishment family. My father was a University Professor and later on Chairman of a large bank. My mother was CEO of a large travel agent. My grandfather was a WWII veteran and a High Court Judge. My family built and owned cities, factories, main streets, shops, with thousands of acres of the prime land in those cities, countless houses and numerous large buildings. I was born with a proverbial ‘silver spoon in my mouth’. When I was born, as an only female child in the family, my paternal grandfather brought my exact weight (4kilos and 250 grams) in gold and diamonds as present to the maternity unit where I was born. And, of course, hired a five star hotel for 24 hours and celebrated with drinks and food for everybody who passed by. My childhood revolved around the school, where I was consistently top student in my generation, and designer, couture fashion. I was typical, upper class, extremely spoiled child and was an unbearable teenager. Of course, we lived the high life, with expensive holidays, constant gifts, holiday homes and life of extreme luxury. I lived in a stable European country, with large army to protect us, with almost no crime, no racial tensions and by the way – a country bigger than the UK. All fine and well and certainly much better life than any of the populist UKIP style racists can possibly imagine. Then my life turned. When I was 18 elections were held in my country and nationalist, proto fascist parties won those elections. Just to draw a comparison, bear in mind that at the last GE UKIP won almost 4 million votes. Imagine if the rest of the racist gang Britain First, BNP, EDL and BNP also took part and won a landslide. Initially, when that scum got elected we laughed at them. Much like various SLAT (Still Laughing At…) BNP, EDL, BF, UKIP websites, blogs, Facebook pages, Twitter accounts and the majority of the normal UK citizens do. We did that too. As soon as nationalistic, fascist parties, full of uneducated, illiterate racists, xenophobes and low-grade criminals took their Parliamentary places, Parliament TV Channel became the most watched comedy channel. We laughed at their stupidity, at their racism, at their lack of logic, at their insults and their overall behavior. While we were laughing at them and dismissing them as a bunch of whack jobs, we completely overlooked the danger they represent to us, until it was too late. Nobody paid attention to their fraud, their massive thefts and their plans how to ‘bring down the Establishments’. Within a year, nobody laughed anymore. Why? Because it is very difficult laughing while heavy artillery, followed by experienced criminals who swelled their ranks started targeting your homes. And contrary to the popular belief, very much present among British upper and middle classes, that money, power, bodyguards, ‘it can’t happen to us because we have money to escape’ attitude, those people, just like we were, will be primary targets for the bunch of nationalistic, fascist fools. And money will not help them. My own father was Chairman of the Bank and had the ability to withdraw our sizeable monetary wealth. But there was one tiny problem. Immediately currency was changed and all our wealth became worthless. Same happened to everything we had in our homes. Heavily armed bandits, under the banner of the police, military or whatever they chose to call themselves that day, came to our door, beat the life out of my parents and my brother, forcefully took them to the front lines to use them as a live shield, and then held in the concentration camps while they were robbing everything my parents and generations before them had earned and accumulated. Of course, our numerous places of residence became theirs too as well as everything we ever owned! Finally, after Red Cross eventually entered those concentration camps we had only one option. To get on the very first plane or train and leave the country, without valid passport (because we became vermin who do not deserve citizenship) while our country did not exist anymore. So what options did we have to survive? To borrow money from a few good people who were not targeted yet and escape somewhere. Yes, with fake passports, yes, smuggled across borders, yes, used and abused by the very same people who were our tormentors but had a business on the side as people traffickers. So before you start talking about ‘vermin’, ‘immigrants’, ‘swarms’ etc at Calais, take a minute from your perceived secure position and realise that tomorrow (and maybe even before looking at the trend of the far-right in the UK as is rising) you and members of your family will all too easily be that same vermin too. And it will not matter one bit if you are (just like many of those Calais’ refugees), highly educated, professors, engineers, OxBridge graduates, doctors, teachers, nurses … you will be denigrated as ‘stupid immigrants’ who should be shot as Nigel Farage as he buys support pandering to simplistic populism and his UKIP followers seemingly suggest. Never forget that if you do not ‘give the masses a room in the castle pretty soon they will seize the castle’, as history has shown us all too often! Let us hope that people will take a more sensible route than the odious populiam of condemnation of these desperate peoples, seeking survival by relocation. We MUST seek a solution to the causes of migrations rather than the simplistic knee jerk reaction of confrontation with the perceived problems. The ONLY solution is to seek to solve the causes and expose those exploiting the dispossesed either as traffickers or the corrupt politicians with populist sound bites for personal gain that do little to confront the causes and thus can never provide the solutions. it is sad that the BBC has displayed its bias and propaganda aims by pretending it has withdrawn this prescient movie from any public circulation having shown it only once in 1990. It does seem that the BBC as a corrupt propoganda organisation funded by an enforced tax has decided to suppress the fact that this movie has become so very representative of the facts today! Clearly the truth does not suit the extreme PC propaganda & bias of the BBC and in this case its censorship is thinly cloaked in the implausible claim that this well made and well acted movie that they never show is protected by copywrite, so also are the 1,000s of other movies that are in circulation that they hold copyright on! This excellent movie would seem never to have been available as a DVD unlike almost every insignificant BBC program that suits their propaganda. IF anyone has or can supply a DVD of this excellent movie please feel free to contact me – my contact details are readily available on the internet.